Jackfruit is native to Asia and is difficult to get fresh here in the states. It has been dubbed the ‘vegetable meat’ in India, because, in its unripe state, it has a stringy, chewy consistency that can replace meat in many dishes. In honor of our supper club this evening, where I will be giving a demo, I’m putting this online for my subscribers. Here in west Michigan, we only have access to canned versions. 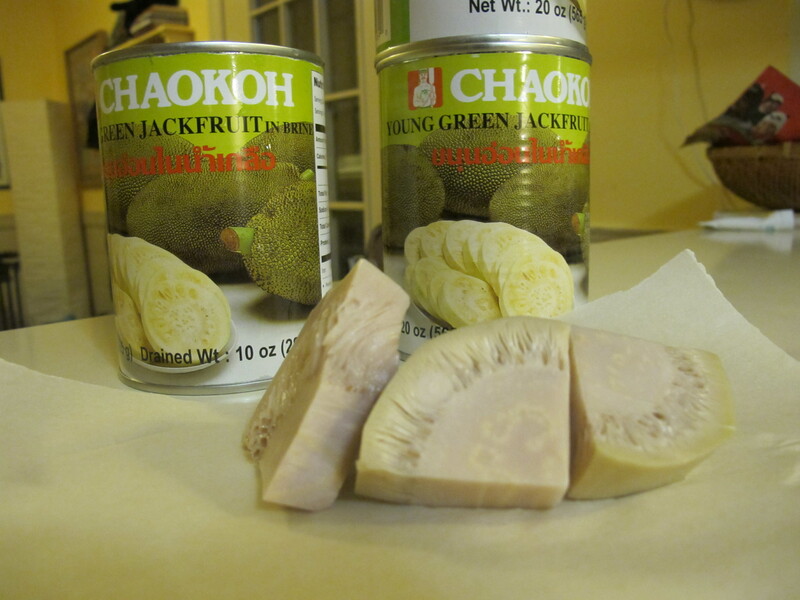 But after reading this blog on the adventures of using a fresh jackfruit, I can live with the canned version for now. Here is the kind that we buy. I have seen it at Spice of India, Mediterranean Island, and Asian Delight Market, next to Horrock’s on 44th. Make sure to get the green ‘unripe’ version of the fruit. The ripe version is sweet. 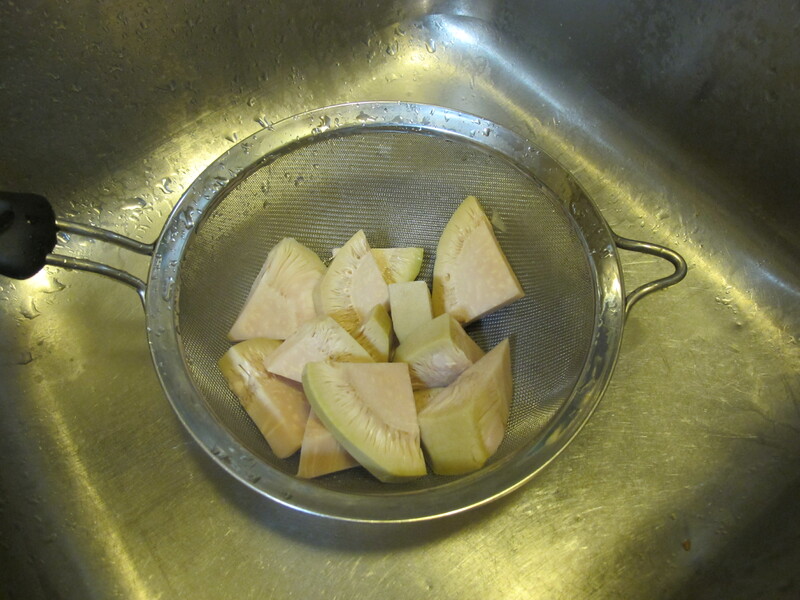 Okay, canned jackfruit is preserved in citric acid, so first thing you want to do is rinse it thoroughly in a strainer. Next, you want to separate the strands. Now, this is where I get a little bored. I don’t know all that much about jackfruit anatomy, but to my thinking, there are three parts to deal with: the lovely stringy stuff, the seedpods and the harder core pieces. strings, seeds and pods, oh my! You could just take a couple of your squeezed handfuls and put them in your food processor. Pulse maybe 5, 6, 7 times. Or you could do as I do and take five minutes to separate the stringy bits from the core and seeds and pulse the bejeebers out the core and seeds first. 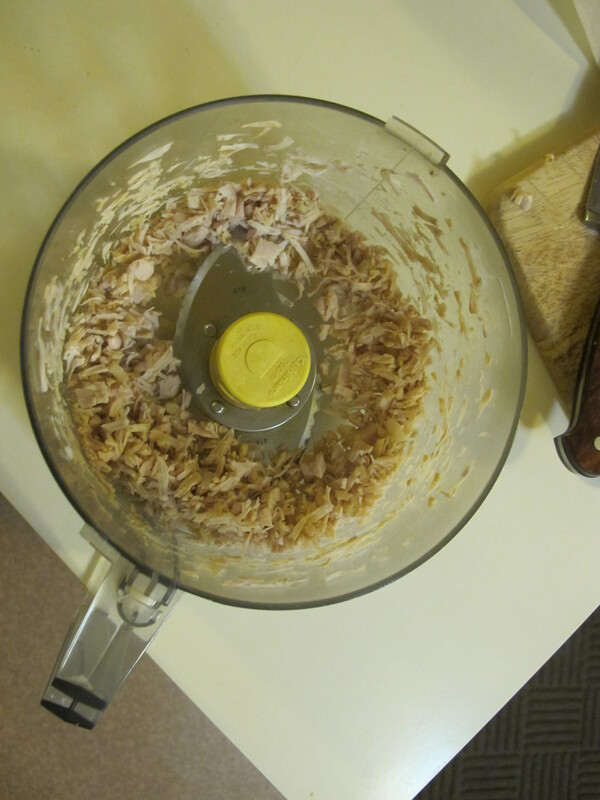 Then add the stringy bit and pulse a time or two more. This is perfect for pulled pork-alikes! But, you can also get a gleeful and throw all the rest in and turn the processor on and end up with…well, something more like sloppy joes! 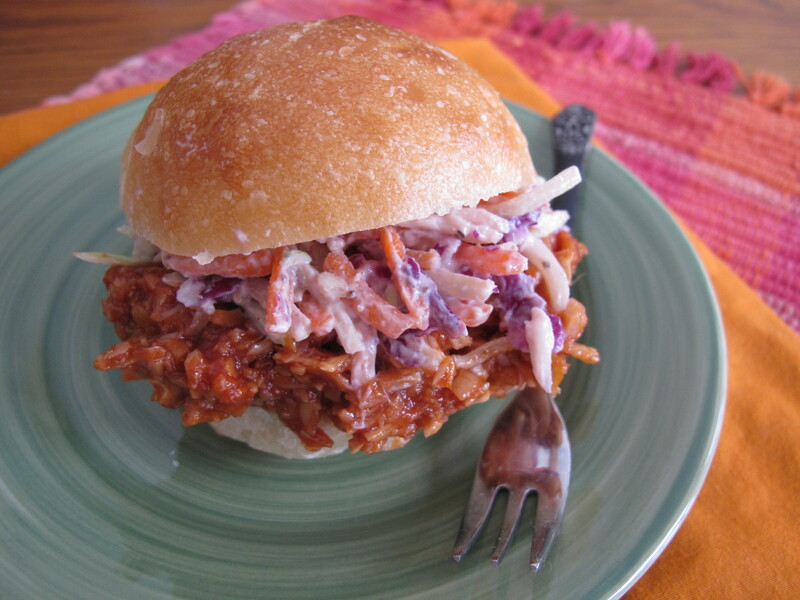 vegan pulled pork with creamy cole slaw…have a fork handy! Below find my favorite ‘no cook’ kinda healthy bbq sauce. We have used jackfruit to make ‘crab cakes.’ These are amazing! Roger, my cooking husband, recommends that you reduce the amount of lemon juice you use to offset the citric acid in the canned fruit. I’ve used them to make jackfruit carnitas with, what else, avocado cream!! They are so very delicious. I will provide recipes for all these things in time, but at the moment, I must clean my house. I recommend eating this Carolina style with a bunch of coleslaw on top. It’s a sweet bbq sauce, too, but you can adjust to your liking. This is so easy, you don’t have to take my class, but it’s a lot of fun if you do! Oh, I’m such a sad girl. Woe is me, I missed the Supper Club. But I’m working my calendar — guarding it actually — in the hopes of being present for the February version. Save me a chair! Of course we will…we’ll save you two chairs! I agree with Cindy. The supper club is super fun. Really looking forward to all the recipes. 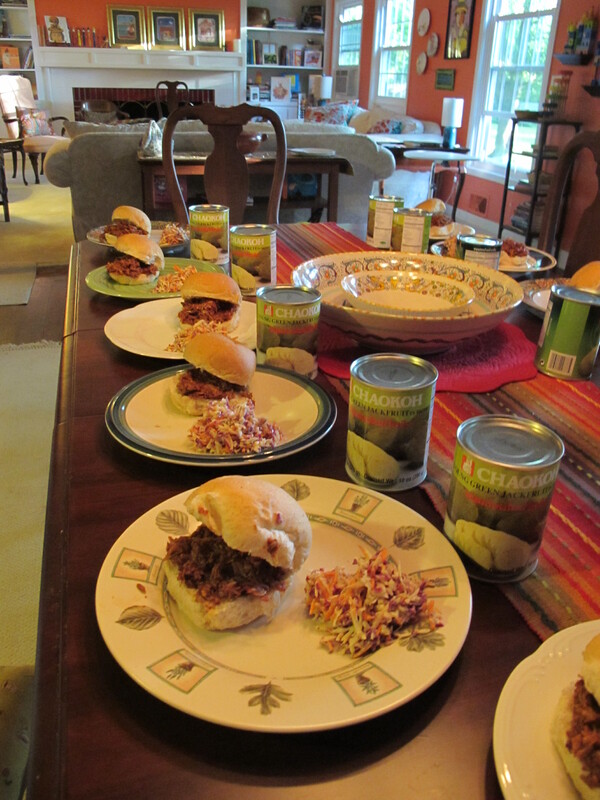 Sue, the Jackfruit sandwich with the coleslaw topping was yummilicious! Giving here a few facts about Jackfruit as you asked me to. I’ve compiled these from a book on Ayurvedic remedies and from the Internet. —Destroys excessive formation of bile and gas in the body. —Carries a good dose of dietary fiber to cleanse the upper and lower intestinal tract from harmful toxins that can cause various digestive tract diseases. —Strengthens the body and also increases virility. —Somewhat laxative; if eaten in excess it may cause diarrhea. —Astringent and indigestible. 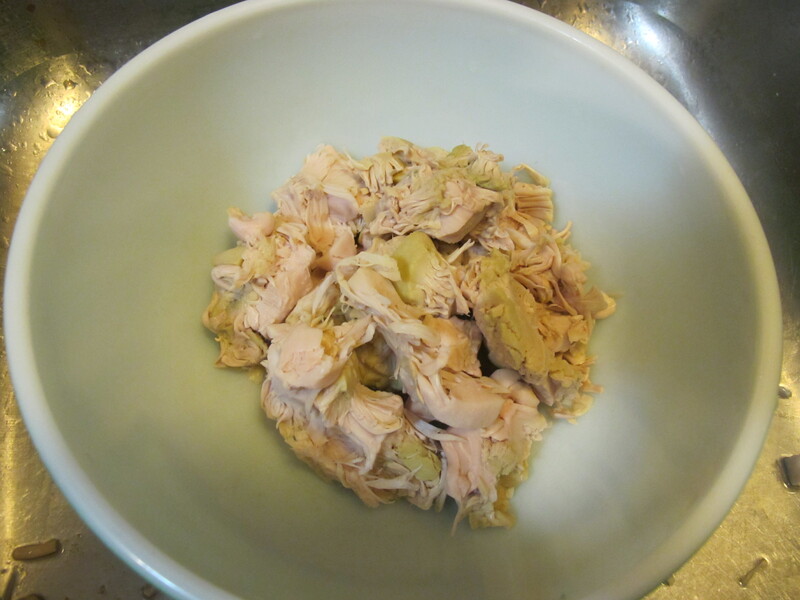 Raw jackfruit seeds are indigestible due to the presence of a powerful Trypsin inhibitor. Boiling or baking eliminates these elements. —May cause constipation, however remedy is simple—-eat coconut afterwards. 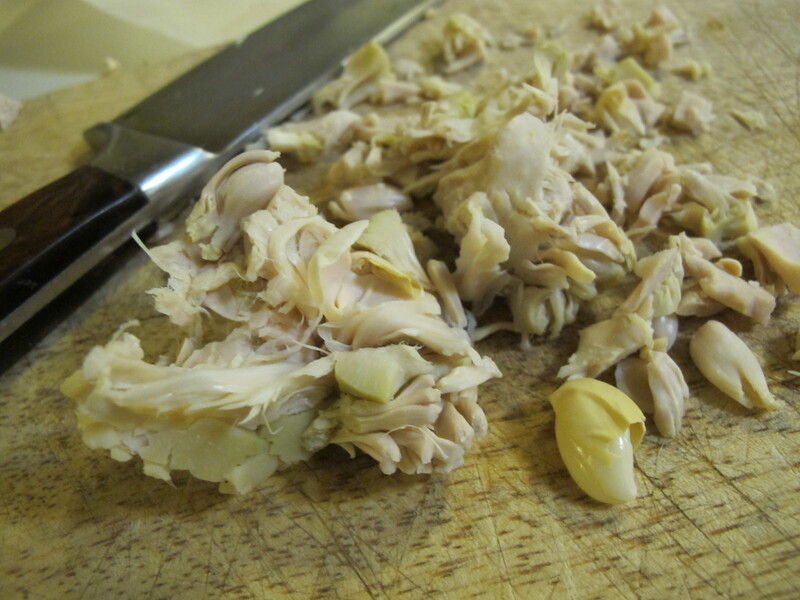 * Being difficult to digest, Jackfruit should be eaten in moderation. * People who are allergic to birch pollen can show signs of allergy towards jack fruit. Thank you so much for this, Medha!